One thing is for sure it smells like bread and butter garlic. No doubt about it. By looking at the cloves in the jar I wasn’t exactly sure if the garlic would be soft or still kinda hard…it’s in-between both. ince this is a nacho cheese sauce, the consistency is what you expect from it: thick when it’s cold, medium thick when it’s warm. Nothing really stands out when I take a good solid whiff of it. Did you know Ed's Roadhouse makes more than just jerky? 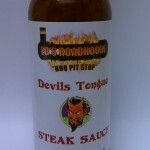 On tonight's Fiery Friday, Brian reviews their Devils Tongue Steak Sauce!